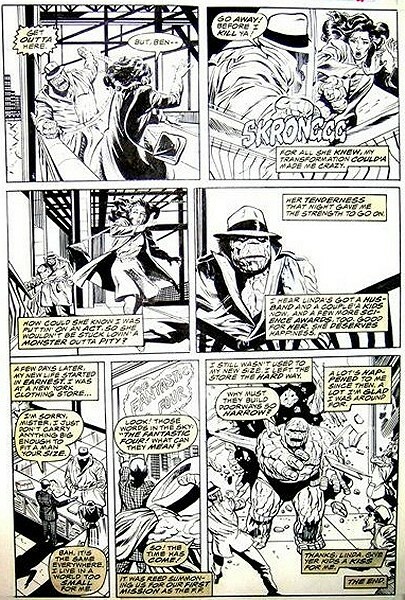 Issue 46, page 8 (second story). This came from the magic of Ebay, in late January of 2006. This Danny Fingeroth-penned story is a marvelous little gem, unjustly lost and forgotten mostly because its just an 8-page back-up story in a so-so issue of the mostly forgotten Marvel Fanfare series (this page is actually printed on the inside back cover). Basically, when Ben first becomes the Thing, he goes and faces his longtime girlfriend, only to have her react in horror. Shortly thereafter, she finds him on a bridge and tries to apologize, but self-pitying Ben drives her away for her own good. If you saw the FF movie, up to the last half of the last sentence, that probably sounded pretty familiar. I only wish that in the movie they'd named the girlfriend "Linda McGill" (her name here) instead of "Debbie." Still and all, a nice addition to Ben's early history, combined with some nice flashbacks to a few classic elements of FF #1 here. I'm very happy to have this one.